Can Ultrasounds Record Cyanobacterial Blooms? Fig. 1 The Sulejów reservoir during cyanobacterial bloom occurrence. Credit: Katarzyna Izydorczyk. These findings are described in the article entitled Night fish avoidance of Microcystis bloom revealed by simultaneous hydroacoustic measurements of both organisms, recently published in the journal Fisheries Research (Fisheries Research 207 (2018) 74-84). This work was conducted by Małgorzata Godlewska, Katarzyna Izydorczyk, and Ilona Gągała-Borowska from the European Regional Centre for Ecohydrology, Polish Academy of Sciences, Helge Balk from the University of Oslo, Zbigniew Kaczkowski, Tomasz Jurczak, and Aleksandra Jaskulska from the University of Łódź, Bronisław Długoszewski from The Stanisław Sakowicz Inland Fisheries Institute, and Joanna Mankiewicz-Boczek from the European Regional Centre for Ecohydrology, Polish Academy of Sciences and the University of Łódź. The experimental work was done within the NCN project Nr. UMO-2012/05/B/NZ9/00980 to Małgorzata Godlewska. Cyanobacterial blooms in open waters, manifested by cyanobacterial scum, foam, or mats floating on the surface (Fig. 1) have been reported for more than 130 years, but their frequency and intensity increased dramatically in the recent decades. Many studies indicated that not only cultural eutrophication (excess concentrations of ammonium, N, and phosphorus, P) but also climate change is responsible for the blooms’ expansion. Furthermore, cyanobacteria may synthesize and secrete organic metabolites, which vary in their toxicity and mechanism of action, including hepato-, dermato-, and neurotoxicity. Bioaccumulation of cyanotoxins in bodies of aquatic animals also was documented. 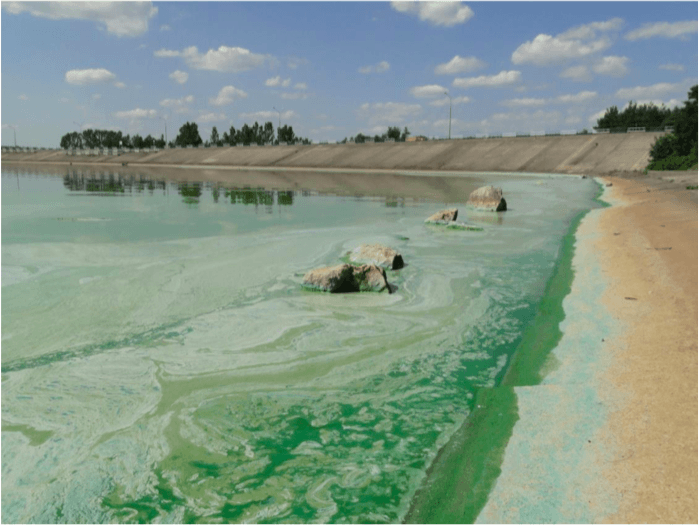 Cyanobacterial blooms lead to severe environmental and human health consequences, have significant socioeconomic and ecological costs, and impact water quality, food web resilience, and habitats. Surface water dominated by toxic cyanobacteria cannot be used as a source of drinking or agricultural water and should be excluded from any recreational use. Therefore, it is of primary importance to have an appropriate tool to study bloom development and propagation over time, which will allow systematic monitoring and appropriate treatment. At present, in order to confirm or monitor cyanobacterial blooms, the measurements of phycocyanine fluorescence are applied. They are carried out using point measurements, which is labor-intensive, time-consuming, and not suitable for studies of spatial dynamics of the bloom, especially over large areas. Remote sensing (satellites) provides spatial information, but has low resolution, is weather dependent, and limited to the water surface area and daylight. Microcystis are one of the major components of cyanobacterial blooms worldwide. This species possesses gas vesicles, which make the cyanobacteria buoyant and enable them to adjust their position to take advantage of optimal light and nutrient conditions. Normally, cyanobacterial cells range in size from 0.5-1 μm to 40 μm, but when in high concentration, they form colonies, which may reach even several centimeters. We expected that such colonies should reflect sound at frequencies used for fisheries research. 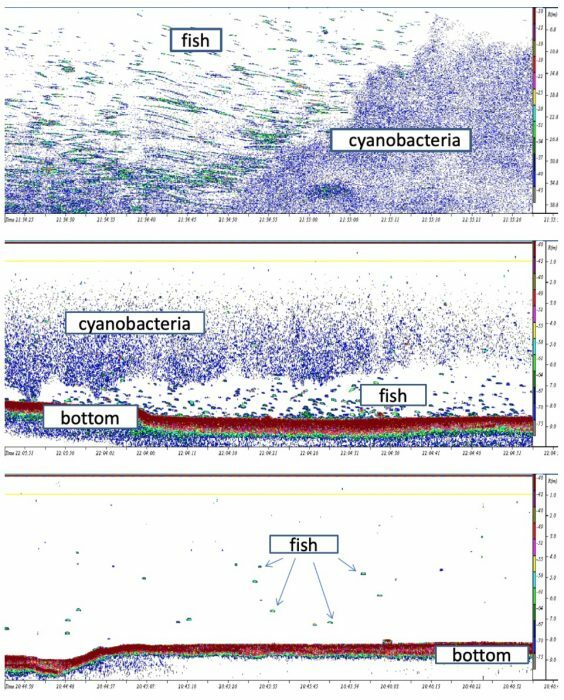 The aim of this study was to investigate the possibility and reliability of using a fishery echosounder to study biomass and distribution of cyanobacterial blooms in open waters and to explore the interactions between fish and cyanobacterial blooms. 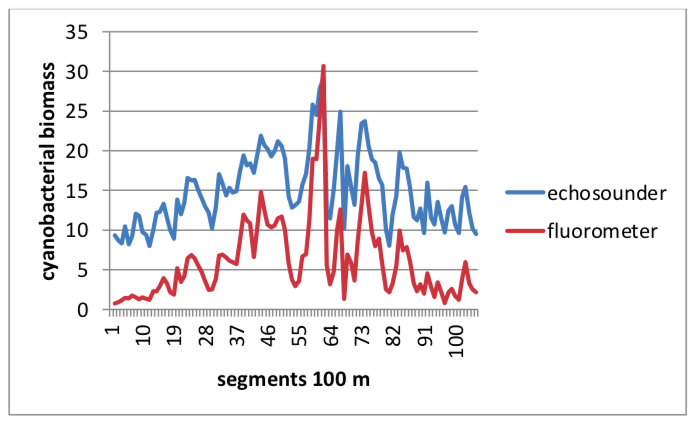 Simultaneous measurements of cyanobacterial bloom distribution using the on-line phycocyanin detection (by Turner Design 10AU Field Fluorometer and echosounder (Simrad EY60, 200 kHz) were performed from 2013-2015 in the shallow lowland of the Sulejów Reservoir. Genetic analyses confirmed the presence of Microcystis (based on a specific fragment of 16S rRNA gene) including toxigenic genotypes with potential to microcistins production (based on a specific fragment of the mcyA gene). Results indicated that the biomass values of cyanobacterial bloom estimated by acoustic and fluorometric methods were highly correlated (R2 =0.88, Fig. 2) and the maps produced (based on average values for 100 m) were practically identical (differences were not significant at p=0.01). Results also revealed a spatial mismatch between fish concentrations and cyanobacterial bloom area (Fig. 3). The lack of any microcystins accumulated in the fish liver and kidneys (measured by HPLC method) confirmed that fish behavioral response to bloom presence effectively decreased their exposure to toxic cyanobacteria. Thus, our results indicated that hydroacoustics provides a new, remote (not affecting the environment) and effective tool to study the spatio-temporal structure of Microcystis blooms, their development, and propagation. The additional advantage of the acoustic method is that simultaneously fish distributions are measured, allowing to explore the relationship between fish and cyanobacterial bloom. Thanks to their high spatial and temporal resolution, acoustic measurements might provide valuable data for modeling and ecohydrological approaches to lake restoration. Malgorzata Godlewska is a research scientist at the European Regional Centre for Ecohydrology of the Polish Academy of Sciences.